Fireworks will burst over Jennings Beach at dusk Thursday for the town's annual sky show saluting Independence Day. Fairfield unfurls a star-spangled salute to the Independence Day holiday next week that includes walking tours commemorating the town's burning by the British during the American Revolution, a dramatic reading of the Declaration of Independence at a ceremony on historic Town Hall Green and, of course, fireworks. The town's traditional Independence Day observance begins with a ceremony at 10 a.m. Thursday on Town Hall Green. Sponsored by the United Veterans of Fairfield, the ceremony includes a dramatic reading of the Declaration of Independence and singing patriotic songs. It is followed by a reception hosted by the Eunice Dennie Burr Chapter of the Daughters of the American Revolution in the Old Academy building. For more information, visit www.EuniceDennieBurrDAR.org. If you plan to head to the beach, you may want to get there early. The Atwood Express Oldies Band will perform at Jennings Beach from 5 to 7 p.m. 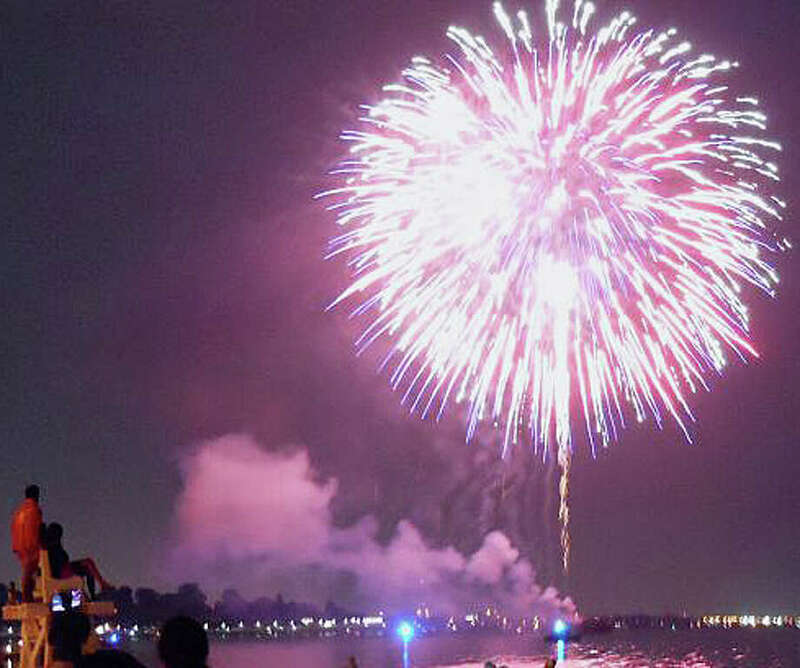 The fireworks are set to go off around 9:15, and parking at both Jennings and Penfield beaches is free after 6 with no beach parking permit required. The rain date is Friday. In case of inclement weather, call 203-256-3144 to check on the status of the fireworks display. Once the fireworks start, all streets leading from the beach area will be one way to the Post Road and no traffic will be permitted south into the beach area until exiting traffic has cleared. In addition, Rowland Road will be closed to all traffic to allow access for emergency vehicles. Police officials have also instituted a new traffic pattern they hope will clear the beach area more quickly. After the fireworks, vehicles leaving the beach area will not be able to turn onto Oldfield or Old Post roads. All traffic must proceed to the Post Road. Cars using Reef Road will be directed to turn left onto the Post Road, and cars on South Benson Road will have to turn right onto the Post Road or go straight onto North Benson Road. Cars using Beach or Unquowa roads will be directed across the Post Road and cannot turn onto the Post Road in either direction. Reef Road; Penfield Road; Lalley Boulevard; Rowland Road; One Rod Highway; Edwards Street; South Benson Road; and sections of Fairfield Beach Road. Cars parked in "no parking" zones will be towed at the owner's expense. You can also commemorate the Fourth of July with a visit to the "Field of Flags" exhibit at Greenfield Hill Congregational Church on Old Academy Road. More than 6,700 flags will be on display, representing service men and women killed in the Afghanistan and Iraq wars. A list of casualties, by name, will be displayed on a board by the "Field of Flags," showing the name and rank of each American casualty.